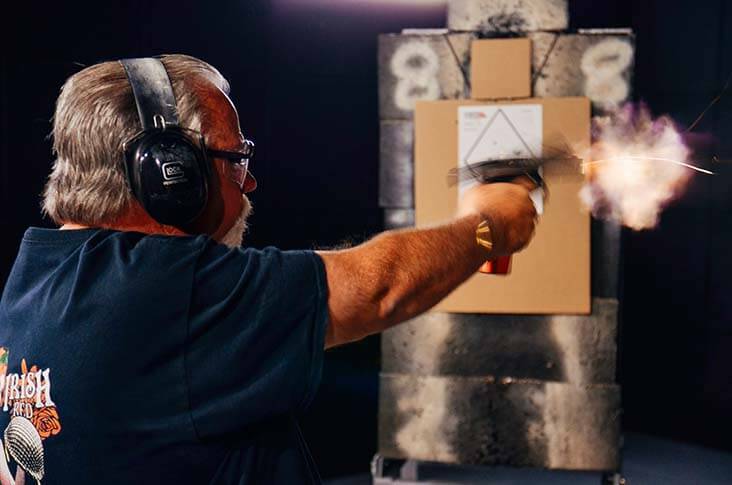 Unlike other gun stores, you can actually test fire all Glock handgun models to determine which you like best, before you buy, in our indoor shooting ranges. 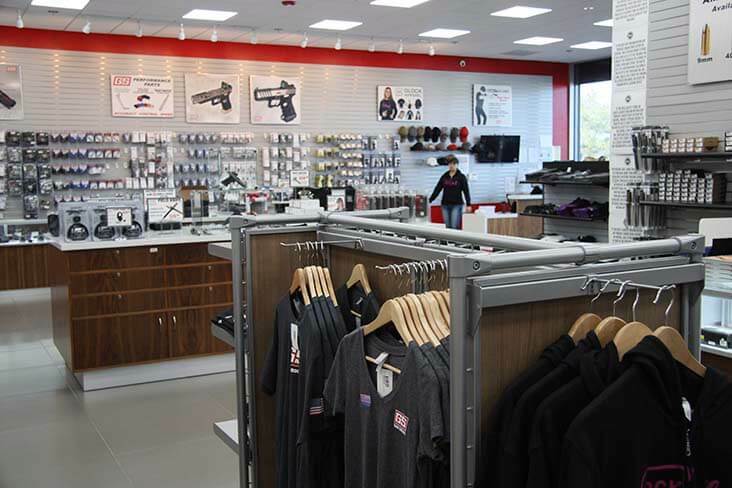 All parts purchased at the GlockStore Retail Showroom are installed by our trained and certified gunsmiths at no additional cost! We are proud of our worldwide reputation for creating the best in high performance, precision Glock handguns for competition shooting, self-defense, home defense, casual shooting and collecting. 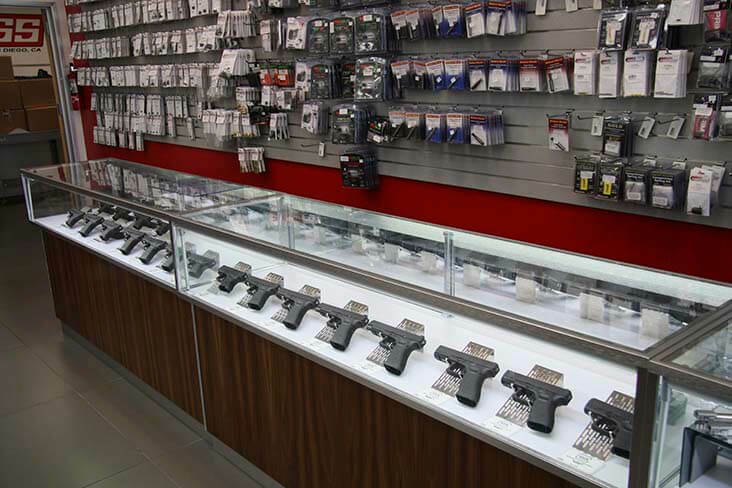 The GlockStore Retail Showroom displays every Glock handgun model currently available, including the world's most popular handguns, the Glock 17 and Glock 19. We also sell all OEM Glock parts and accessories along with a large selection of Glock magazines, in stock and ready to take home. You'll also find a large selection of Glock logo apparel, T-shirts, hats, Glock Field Knives, and every accessory from the Glock factory. We also offer an incredible selection of the best aftermarket, high performance parts for your Glock, including the world renowned Pyramid Trigger, Tungsten Guide Rods, and a huge selection of night sights from all the major manufacturers. These parts will improve your shooting and allow you to customize your Glock to get the best performance for competition, self-defense, and home-defense applications. Our customers can always rely on consistent, friendly, and knowledgeable advice from one of our professional staff members. 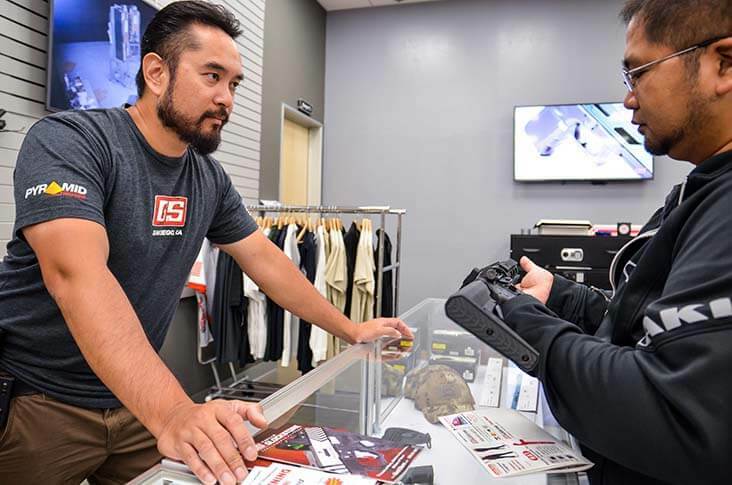 Whether this is your first time buying a gun or you're a long time gun owner, we are here to help you get the most out of your firearm experience. They aren't the "normal" lane ranges, where you line up with people you don't know and shoot down range at a single, static target. At that type of range you don't have any idea of who is shooting next to you; their skill level; their state of mind; or even how sober they are! 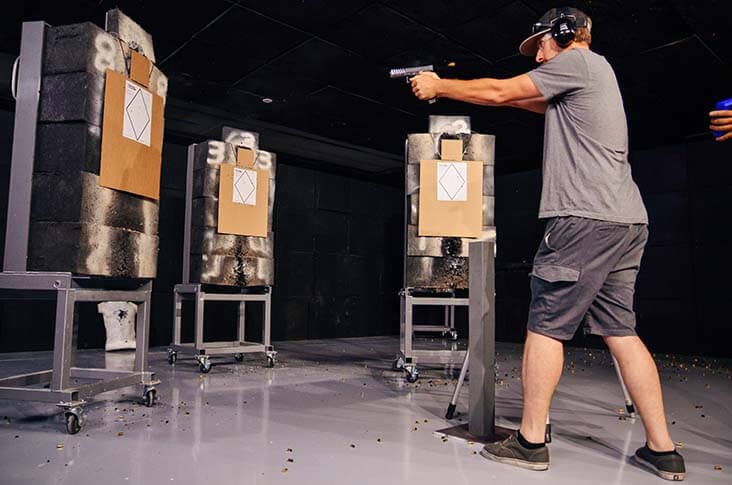 Our Indoor Shooting Ranges are private "Shooting Rooms" which allow you to learn and train one-on-one with a personal instructor. You are in a specially designed room that allows you to shoot at multiple targets in multiple directions - just like in real life! In addition to complete privacy, this type of training allows you to focus on and not be distracted by other people. Many of our customers are new to shooting and we find that they not only enjoy the privacy aspect of the Shoot Rooms, but also learn much faster and have a much better experience. 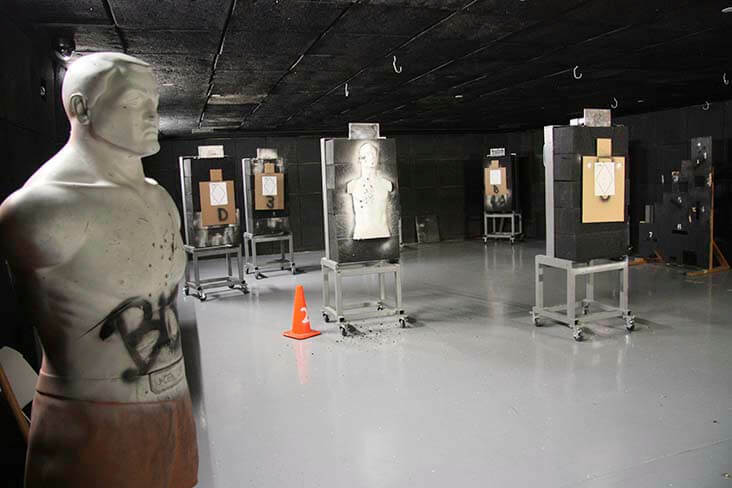 Our customers who are already experienced shooters like training in our private Shoot Rooms because they can practice real-life scenarios, such as drawing from concealment and engaging multiple targets… activities that just aren't allowed at lane-based facilities. In our shoot rooms, we can set up scenarios that will challenge and train you for real life shooting: Room clearing, shooting and moving, shooting around cover, one hand shooting, shooting with lights and lasers, we can even darken the room to simulate late night shooting. The possibilities are endless and the training is un-matched at any other indoor shooting facility in Southern California. Plus, since many of our customers don't want anyone to know that they own and train with firearms, for a variety of reasons, we maintain strict privacy rules at all times. Whether you're looking for instruction as an individual, a couple, a family, or even as a corporate "team building" event… we can accommodate your specific requirements. All Shoot Room rentals come with an experienced instructor to assist you with targets, loading magazines, setting up scenarios, etc. You'll find that you can shoot a lot of rounds and learn a lot in a 30 or 60 minute session with one of our instructors. Our normal business hours are Monday - Friday from 9am - 6pm and Saturday's from 9am-4pm. However, we are available, by appointment, seven days a week from 6am to 12 midnight for an ultra-private shooting experience. Every gun owner should have a working knowledge of the operation and maintenance of their firearm. 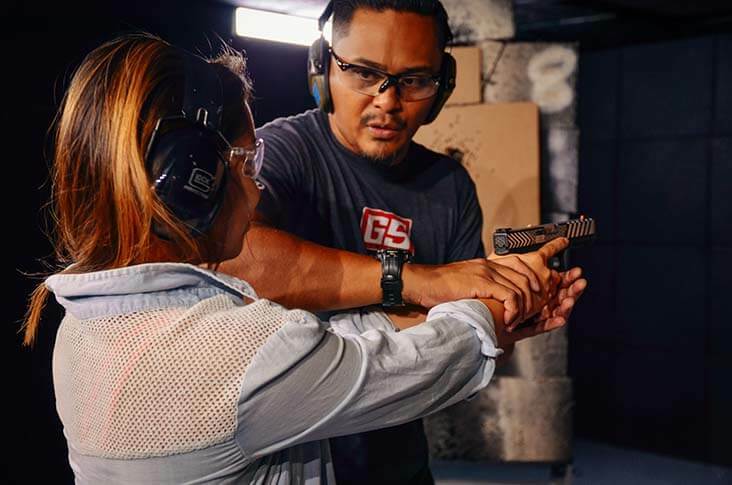 At the GlockStore Indoor Shooting Ranges we offer a variety of ways for you to become a safer, more knowledgeable, and more confident gun owner. From group sessions on firearm maintenance to private, individual instruction precisely tailored to your current skill set and desired proficiency level… our certified instructors distill their years of experience into easy to learn, step-by-step instructions that will have you proficient, safe, and comfortable with your firearm. We offer private instruction for individuals, couples, families and small groups. Each session is tailored to your specific needs and current skill levels. 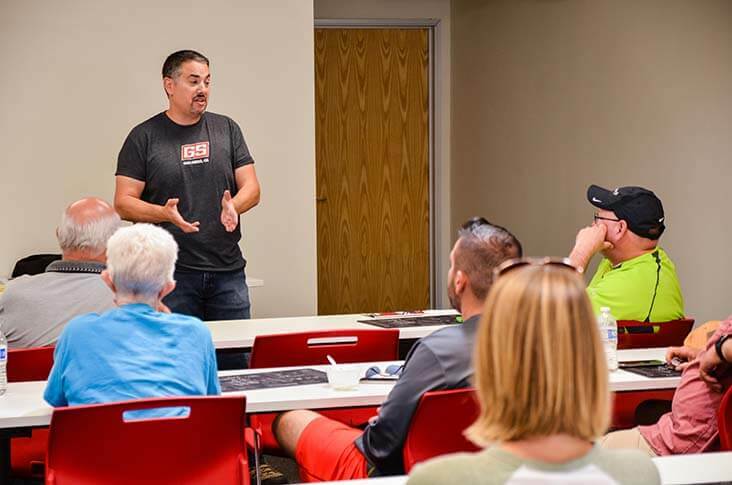 We can start with the basics of safety; the fundamentals of shooting and accuracy; or the cleaning and maintenance of your specific firearm in our classroom environment. If you're more advanced, we can go directly into the shooting range and set up scenarios with multiple targets; shooting from behind cover; shooting on the move; night fire practice; draw and fire from concealment, and much, much more. Whatever it is that you want to accomplish, we have the people and the facilities to help get you there. Private instruction is normally booked by appointment, and is available seven days a week, from 6am to 12 midnight. 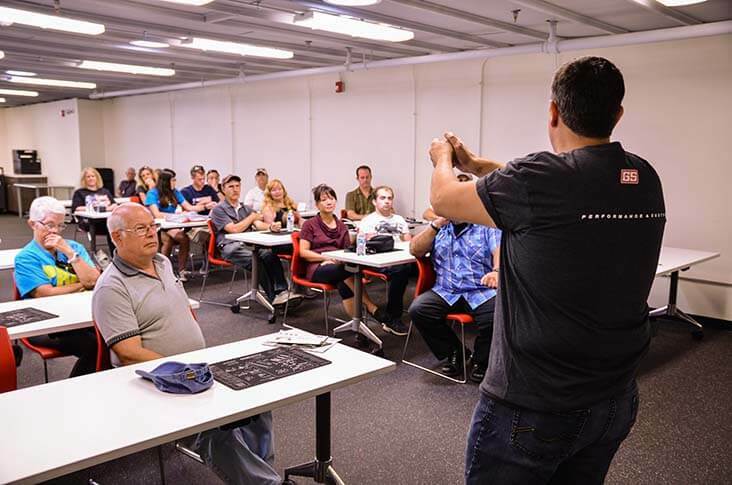 On a regular basis, we offer group classes on a variety of subjects. 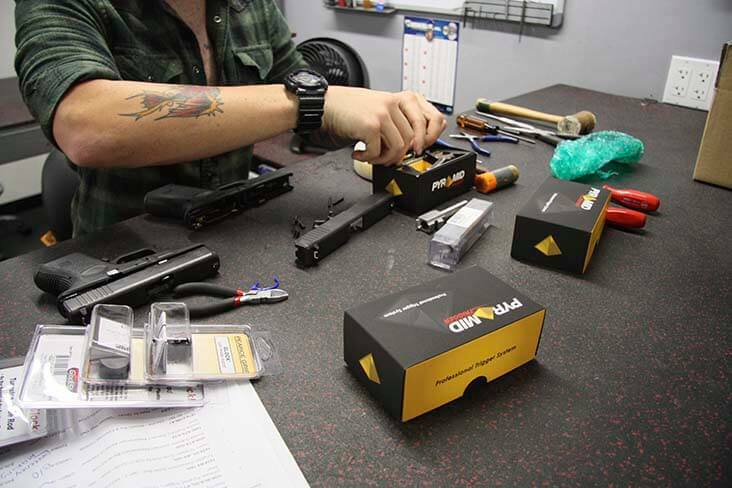 One of our most popular classes is the GlockStore Armorer's class. 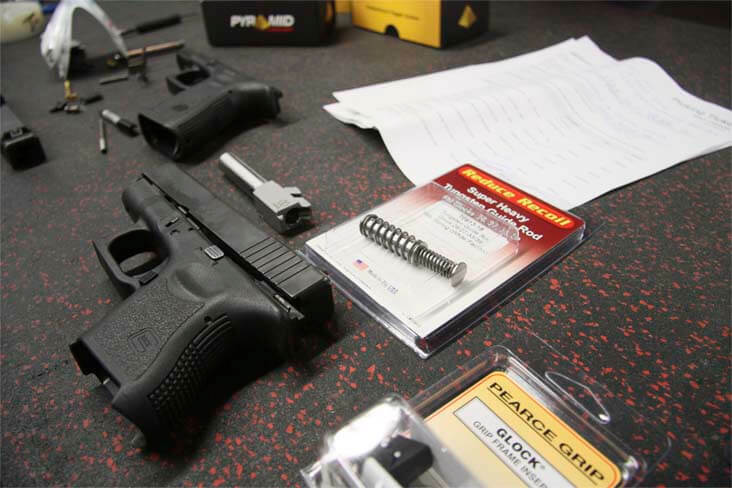 This class teaches you how to completely disassemble and reassemble your Glock handgun. Each part is identified and discussed as to its function and purpose. As you reassemble the gun, we review cleaning and oiling procedures for long term care and reliability. We also invite guest instructors to come to our facility to train and shoot with our customers. These classes are scheduled in advance and feature some of the best instructors in the world. Advance reservations are required as the class sizes are limited to allow for the best training experience for our guests. Please see our schedule here. GUNfit is a fun, unique, and exciting training program designed to improve your shooting for self and home defense… and have lots of fun in the process! You'll shoot, and compete, with a small group of like-minded individuals. 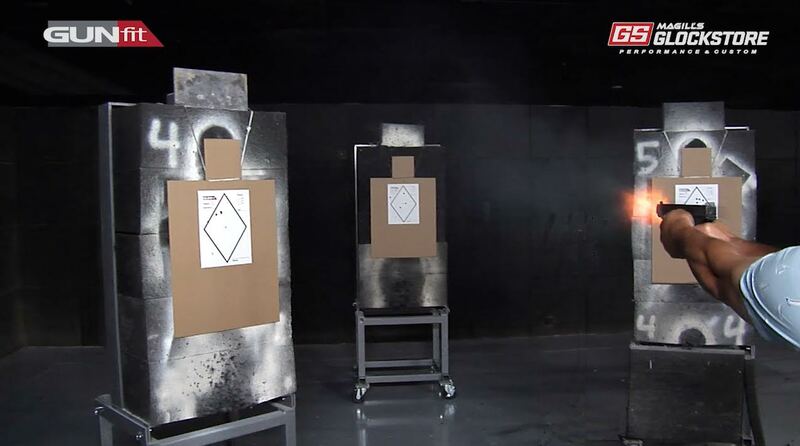 After a few rounds of GUNfit, you can't help but shoot faster and more accurately. Each class is just one-hour and you'll shoot several sets at multiple targets, in multiple directions, while being timed. Your overall score is based on your speed and accuracy and will give you a benchmark of your current skill level. Expect to shoot 150-200 rounds per one-hour session. In just a few sessions, GUNfit participants invariably become much better shooters in both speed and accuracy. GlockStore is known worldwide for creating the best high performance, precision Glock handguns for competition shooting, self defense, home defense, casual shooting, and collecting. We own and operate 10 CNC machines in our San Diego, CA location to insure the highest quality; most consistency; and fastest turn-around in the industry. Our gunsmiths are Certified Glock Armorers and offer an unmatched attention to detail combined with a flair for creativity. If you have an idea or a concept for a custom Glock handgun, I invite you to call us to discuss the possibilities and scheduling. You can send your Glock directly to GlockStore for customization and once the work is completed we can send it directly back to you. No additional FFL or paperwork is required. Or, if you like, you can purchase a new Glock handgun from us and then have us customize it to your exact specifications. Many of our customers enjoy doing their own customizations at home. We support these customers with all the top quality parts and accessories they need, as well as any custom machine shop work they may require for the build, including slide cuts, front serrations, Red Dot optic cuts, colorizing, refinishing, and stippling. For ideas and to see what is possible, click here to review some of our custom build Glock handguns. Customers call everyday and ask "How can you be in the gun business in California?" Our response, "It's Not Easy… and it's getting Tougher!" California gun laws are very restrictive and for us to continue to grow we are starting the process of opening a new East Coast GlockStore Showroom in Nashville, Tennessee! It's a big undertaking and you can help us by becoming a member now. You'll save money on your online orders and get preferential treatment on our weekly specials, limited editions, and shooting at all of our locations… existing and future. Thank you for your help and continued support. All members will receive the GlockStore logo hat and T-Shirt along with a membership card. Once you sign up and become a member we will code your account to receive discounts on all future orders for GlockStore brand products. This includes our very popular Pyramid Trigger, Tungsten Guide Rods, Double Diamond Connectors, magazine base plates and lots more of your favorites products. And, we keep designing new products every week that will qualify for the your discount level. Please allow 24-48 hours for your membership to become active on our website. Then, once you sign into your account your discount price will automatically appear and transfer into your shopping cart each and every time your make a purchase. Remember, you must make an account and be signed in before you purchase a membership option so that we can properly link your new money saving status!